Airplanes Operating Private and Charter Flights worldwide substantial increase in accidents in 2011. While a small amount of operations continued to be one of the safest segments. According to AIN, total accidents involving U.S.-registered business jets nearly doubled, from 17 in 2010 to 32 in 2011. U.S.-registered turboprop accidents jumped from 32 in 2010 to 43 in 2011. This increase in the number of accidents coincides with an increase in the number of business jet flight operations worldwide. Statistics compiled by the FAA, flight operations including arrivals and departures, increased by approximately 4 percent between December 2010 and November 2011 over the same time period just a year earlier. The number of fatalities in turboprop accidents more than doubled in 2011 from where 29 people were killed in 11 accidents last year compared to 12 people killed in four accidents in 2010. By the fourth quarter of 2011 alone, 13 people died in four fatal accidents involving a private or corporate-owned turboprop, while there were no fatal turboprop accidents in the final quarter of 2010. In 2011, two people were killed in two fatal accidents of turboprops, whereas two people were killed in turboprop crashes in 2010. In 2011, two of the fatal turboprop accidents involved airplanes operating outside the U.S.
Because the FAA and NTSB draw fine distinctions between “incidents” as well as “accidents”, these agencies are inconsistent and hopefully the status of the occurrence may change. An example of these inconsistencies would be runway overruns, retracted landing gear, and gear-collapse mishaps, which are typically listed as incidents by the FAA and not calculated by the NTSB. However, when an occurrence causes substantial damage or serious injury, the NTSB would record it as an accident. In other incidents, if they don’t result in serious damage or injury, these are usually listed just as incidents. These incidents can include precautionary engine shutdowns, flameouts, bird or other animal strikes, blown tires, window separations, doors opening, lightning strikes, system malfunctions, parts departing an airplane, loss of control, and turbulence. Additionally, depending on what is found during the investigation, events initially classified as incidents are sometimes dropped from safety databases, if investigators consider them inconsequential. Some mishaps which were preliminarily listed officially as incidents, have been changed to accidents because of the seriousness of their nature. While a Tucson Police Department Air Support Unit was training near the Tucson International Airport the aircrew witnessed a Robinson R-22 civilian helicopter crash. The Police aircrew made an immediate landing and directed emergency responders to the downed Robinson R-22 aircraft. The air support crew heard the pilot’s distress call, and then relayed the situation to officers on the ground. The Robinson R-22 crashed in an undeveloped desert area which is on the southwestern portion of the Raytheon Missile System facility. The police air crew then directed emergency responders to the crash site. The pilot of the Robinson R-22 helicopter reported engine failure when it went down about 1.5 miles south of Tucson International Airport. There were 2 people on board the chopper. According to the Federal Aviation Administration (FAA), and engine failure may be to blame for the Robinson R-22 helicopter crash. The only person aboard the Robinson R-22 who was treated for injuries was the pilot. The pilot of the downed Robinson R-22 was airlifted to University Medical Center (UMC) for treatment. Raytheon was operating the helicopter which is registered to the Double Eagle Aviation Flight School. The Double Eagle Aviation Flight School is located at the Tucson International Airport. The sole survivor of a 2008 Maryland State Police helicopter crash in District Heights has filed a $50 million lawsuit against the Federal Aviation Administration, alleging negligence on the part of air traffic controllers. Jordan Wells, 20, of Waldorf filed the suit Dec. 7 with the U.S. District Court for the District of Maryland in Greenbelt. The suit states that before the Sept. 27, 2008, crash, the FAA traffic controllers who were based at Joint Base Andrews gave Maryland State Police pilot Stephen J. Bunker dated information on weather conditions, failed to guide him in the Trooper 2 helicopter to a safe landing as navigation equipment began to falter and did not alert paramedics to the scene of the crash. Wells, who was 18 at the time, survived the crash into a wooded area of Walker Mill Regional Park in District Heights but lost her right leg as a result. Bunker, 59, of Waldorf; Trooper 1st Class Mickey C. Lippy, 34, of Westminster, a state police flight paramedic; Tonya Mallard, 39, of Waldorf, an EMT for the Waldorf Volunteer Rescue Squad; and Ashley J. Younger, 17, of Waldorf, died in the crash. Wells’ attorney said that she is “scarred from head to toe” and has suffered from post-traumatic stress disorder and feelings of survivor guilt. She has had to learn how to walk again and drives a modified vehicle, he said. Wells’ lawsuit is the third related to the crash. Kenneth Mallard, husband of Tonya Mallard, filed a $7 million suit against the FAA on July 21 in federal court that also claims the FAA did not ensure Trooper 2’s safe landing. Mickey Lippy’s widow, Christina P. Lippy of Westminster, sued the FAA in March in federal court for $15 million on behalf of her husband. Prior to the crash, Trooper 2 picked up Younger and Wells, who were involved in a vehicle crash in Waldorf. The helicopter was originally going to fly to Prince George’s Hospital Center in Cheverly, but foggy weather conditions forced them to reroute to Joint Base Andrews, where an ambulance waited to transport them to Prince George’s Hospital Center. Bunker was unable to pick up a glideslope, a navigation system to help guide an aircraft to the runway, during flight. While in contact with the air traffic controller at Andrews’ tower, the controller replied, “It’s [the glideslope] showing green on the panel, but you’re the only aircraft we’ve had in a long time, so I don’t really know if it’s working or not,” court documents state. An Andrews FAA air traffic controller told Bunker just before midnight that she could not provide him with “airport surveillance radar approach,” radar that gives an aircraft vertical and lateral guidance to safely reach the runway, court documents state. No additional attempts were made with Trooper 2 shortly before it crashed, court documents state. Whether the air traffic controller who discussed the glideslope with Bunker is the same one who could not provide the radar service is not stated in court documents. The suit claims that air traffic controllers never called to say the last-known coordinates of the helicopter, and that Wells’ leg could have been saved if she had not been in the woods for two hours with the helicopter laying across her legs as paramedics struggled to find the aircraft’s location. “The infection set in because she was sitting in the mud with an open wound,” said her attorney, who added that to date Wells has had 30 surgeries related to injuries she suffered in the crash. FAA spokeswoman Arlene Salac said she could not comment on any of the pending litigation. The pilot of a Missouri State Highway Patrol helicopter, Sgt. Joe Schuengel died in a crash in a residential subdivision in the Clarkson Valley area. No one on the ground was injured. Sgt. Joe Schuengel was a 17 year veteran of the highway patrol. The Bell 206B helicopter only carried Sgt. Schuengel, who was killed on impact. The Bell 206B was assigned to traffic enforcement. The Bell 206B helicopter came down on a street and did not hit any homes. The Bell 206 helicopter was working speeding enforcement above Interstate 55 in Jefferson County. Two other highway patrol troopers were in the helicopter for that duty, however Sgt. Schuengel had already dropped them off and he was returning to Spirit of St. Louis Airport in Chesterfield when the Bell 206 helicopter crashed. The copter crashed along Horseshoe Ridge Road, of Kehrs Mill Road in an unincorporated St. Louis County between Chesterfield and Ballwin. The subdivision is the Kehrs Mill Trail subdivision, consisting of 102 homes that each sit on two acres or more. At the crash site, witnesses saw the wreckage, which was strewn with glass and papers. The Bell 206 Helicopter was smoking and spilling gas and oil. Several Ameren Missouri workers who were also in the area said that when they got to the crash site, they found the helicopter’s rotor had detached from the flattened wreckage. The rotor ended up in someone’s yard. The patrol’s aircraft division had five helicopters, some of which are used in conjunction with the Defense Department for marijuana eradication, while others, like the Bell 206 Sgt. Schuengel was flying, are used for traffic enforcement and searches by air. According to the Federal Aviation Administration (FAA), the Bell 206B JetRanger helicopter was manufactured in 1981. The Bell 206B helicopter was Troop C’s only helicopter. Sgt. Schuengel assisted in searches for missing children in the area and often appeared at community events as a representative of the highway patrol. St. Schuengel is the 29th member of the Missouri Highway Patrol to die in the line of duty. An air ambulance helicopter crashed into a wooded area of Arkansas early Tuesday, killing all three crewmembers and raising the death toll in the industry to 22 in the past year.The Air Evac Lifeteam chopper was flying to pick up a victim of a traffic accident when it hit trees and crashed, bursting into flames about 4:30 a.m., Federal Aviation Administration (FAA) spokesman Lynn Lunsford said. The pilot and two medical crewmembers died, he said. The crash, near the town of Scotland, is the latest in a surge of accidents and fatalities. The past year has seen 14 accidents involving air ambulance helicopters, eight fatal, government statistics show. Since June, four crashes have killed 10 people. Advocates for safety improvements said the crash is further evidence of the need for stiff new requirements on medevac flights. “There is a long way to go and we’re not there yet,” said Stacey Friedman, whose sister, flight nurse Erin Reed, died in a 2005 crash. The National Transportation Safety Board (NTSB), which is heading the investigation into Tuesday’s crash, has issued numerous suggested safety improvements for the industry in recent years. The agency has no regulatory authority. The FAA, which oversees the industry, is writing new rules but will not unveil them until fall. Congress has several bills addressing safety, but those have stalled in a deadlock over FAA’s funding. Dan Hankins, a physician who directs a hospital air-ambulance program and is president of the Association of Air Medical Services, said he supports adoption of the NTSB’s recommendations. However, he acknowledged that not all of the companies in his organization back the recommendations. The NTSB wants new requirements for equipment that can help prevent pilots from getting disoriented in poor visibility, better pilot training and improved internal monitoring for safety lapses. A Tucson medivac helicopter crash has left three people dead, the Associated Press and local Arizona media are reporting. The latest AP reports list the status of one person as dead, and two others as injured, but the AZ Daily Star is reporting that the other two crash victims died as they were being transported to the hospital for treatment. It was later confirmed that all three people onboard were either killed on impact, or died shortly after the crash. Just after 1:30 p.m. on Wednesday afternoon, numerous 911 calls were made reporting the Tucson helicopter crash. The LifeNet medical helicopter, which was reportedly en route from Marana to Douglas before it crashed Wednesday afternoon, slammed into the ground and nearly into a house. The Tucson helicopter crash Wednesday took place near Glenn and Grant Road, just north of the University of Arizona campus. According to the Associated Press, a witness indicated the rotor may have seized and left those aboard the LifeNet helicopter powerless to help themselves before crashing. The Tucson helicopter crash did not cause any injuries on the ground, and there were no patients in the helicopter. LifeNet is a non-profit which primarily deals with transporting organs for donation and transplant, according to LifeNet.com. The identities of the LifeNet personnel killed in today’s Tucson helicopter crash will be withheld from the public until the families can be notified. A thorough on-scene investigation into today’s LifeNet helicopter crash is ongoing at this hour and may continue through Thursday, according to Arizona Daily Wildcat report. Tucson Police and Fire initially responded to the scene of the crash, and the FAA will join them to determine the cause of the crash. Helicopter Emergency Medical Service (HEMS) operations are unique due to the emergency nature of the flight. The FAA, operators, and the medical community all play a vital role in promoting a positive safety culture that ensures the safety of passengers, flight crews, and medical professional on these flights. Encourage risk management training to flight crews so that they can make more analytical decisions about whether to launch on a flight. Better training for night operations and responding to inadvertent flight into deteriorating weather conditions. Promote technology such as night vision goggles (NVGs), terrain awareness and warning systems (TAWS) and radar altimeters. Provide airline-type FAA oversight for operators. Identify regional FAA HEMS operations and maintenance inspectors to help certificate new operators and review the operations of existing companies. There are approximately 840 emergency medical service helicopters operating today, most of which operate under Part 135 rules. 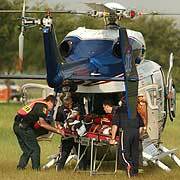 The HEMS fatal accident rate is 1.18 per 100,000 hours. The fatal accident rate for all general aviation and air taxi flights is 1.13 per 100, 000 hours. It is 1.00 and 1.94 for other turbo-shaft and all piston helicopters respectively. The number of HEMS accidents nearly doubled between the mid-1990s and the HEMS industry’s rapid growth period from 2000 to 2004. There were nine accidents in 1998, compared with 15 in 2004, five of which resulted in 17 fatalities. The main causes were controlled flight into terrain (CFIT), inadvertent operation into instrument meteorological conditions and pilot spatial disorientation/lack of situational awareness in night operations. Safety improvements were needed. Aviation safety decisions are separate from medical decisions. The decision to conduct a flight with a patient on board does not mean that flight safety can be compromised in any way. Once the medical need for air transportation is determined, it is up to the HEMS operator to make the air transportation decision based on pre-flight factors such as weather conditions, maintenance, and crew readiness. The FAA inspects HEMS operators, but has prompted changes beyond inspection and surveillance. Rather, the FAA uses a risk-based system that includes the initiatives outlined below which focus on the leading causes of the HEMS accidents. In August 2004, the FAA established a task force to review and guide government and industry efforts to reduce HEMS accidents. On January 14, 2005, the FAA hosted a meeting with HEMS industry representatives to discuss safety issues and gain feedback. Representatives from the Association of Air Medical Services, Helicopter Association International, the National EMS Pilots Association and several operators attended. Decision-making skills: On January 28, 2005, the FAA published a notice providing guidance for safety inspectors to help operators review pilot and mechanic decision-making skills, procedural adherence, and crew resource management practices. It includes both FAA and industry intervention strategies (Notice 8000.293 Helicopter Emergency Medical Service Operations). These principles were reinforced in the “Safety Alert for Operators” (SAFO) 06001 issued on January 28, 2006. Risk assessment programs: On August 1, 2005, the FAA issued guidance to inspectors promoting improved risk assessment and risk management tools and training to all flight crews, including medical staff (Notice 8000.301 Operational Risk Assessment Programs for Helicopter Emergency Medical Services). Air Medical Resource Management (AMRM): On September 22, 2005, the FAA issued guidance to HEMS operators establishing minimum guidelines for Air Medical Resource Management (AMRM) training. The training focuses on pilots, maintenance technicians, flight nurses, flight paramedics, flight physicians, medical directors, specialty team members (such as neonatal teams), communications specialists (dispatchers), program managers, maintenance staff, operational managers, support staff, and any other air medical team members identified by specific needs (AC No. 00-64 Air Medical Resource Management). Special emphasis inspection program: On September 27, 2005, the FAA issued revised standards for inspection and surveillance of HEMS operators, with special emphasis on operations control, risk assessment, facilities and training, especially at outer locations away from the certificated holder’s principal base on operations. FAA establishes new office: In December 2005, the FAA’s Flight Standards Service’s Air Transportation Division established the new Commuter, On Demand, and Training Center Branch (AFS-250) to work Part 135 and Part 142 policy issues. The FAA has begun hiring aviation safety inspectors with specific “helicopter only” experience in order to keep pace with industry growth. Loss of Control (LOC) and Controlled Flight Into Terrain (CFIT): On January 24, 2006 the FAA issued a handbook bulletin to inspectors describing acceptable models for LOC and CFIT avoidance Programs. The bulletin provides inspectors with information to provide to HEMS operators for developing LOC/CFIT accident avoidance programs and clarifies existing guidance (HBAT 06-02 Helicopter Emergency Medical Services (HEMS) Loss of Control (LOC) and Controlled Flight Into Terrain (CFIT) Accident Avoidance Programs). HBAT 06-01 & OpSpec A021: On January 24, 2006 the FAA issued revised guidance to inspectors regarding HEMS OpSpecs, amending the Visual Flight Rule (VFR) weather requirements for HEMS operations, including consideration of the adverse affects of reduced ambient lighting at night and mountainous terrain (HBAT 06-01 Helicopter Emergency Services; OpSpec A021/A002 Revisions). Public HEMS operators: On March 2, 2006, the FAA issued guidance to inspectors on the surveillance and oversight of public aircraft operators for HEMS operations (Notice 8000.318 Public Helicopter Emergency Medical Services (HEMS) Operations). Terrain Awareness and Warning Systems (TAWS): On June 27, 2006, at the FAA’s request, RTCA, Inc. established a Special Committee to develop Helicopter Terrain Awareness and Warning System (H-TAWS) standards. These standards will be used to develop FAA requirements for H-TAWS systems, installation and operations. Aeronautical Information Manual: In August 2006, the FAA revised the Aeronautical Information manual (AIM) to provide guidance to pilots on assessing ambient lighting for night visual flight rule (VFR) operations and for off-airport/heliport landing zone operations. Aviation Rulemaking Committee (ARC): The FAA is currently reviewing the 140 recommendations made by the Part 135/125 ARC. We have begun rulemaking on many issues which pertain to HEMS operations and training. Examples of the areas considered for change are: weather requirements for IFR flight, medical personnel as crew, IFR landing minimums, instrument flight competency, etc. International Helicopter Safety Team (IHST): The helicopter industry has formed the IHST to gather data and draft strategies to reduce helicopter accidents globally by 80 percent by 2015. The effort is modeled on the Commercial Aviation Safety Team (CAST) which has achieved a significant reduction in the commercial fatal accident rate in the United States. Members include the FAA, European Aviation Safety Agency (EASA), Transport Canada, the International Civil Aviation Organization (ICAO), and industry representatives. Surveillance of large HEMS operators: The FAA’s Flight Standards Service established a task group to focus on the certification and surveillance requirements for large HEMS operators that support diverse medical programs throughout the United States. The group’s findings resulted in the increase in the cadre of inspectors assigned to HEMS operations. Operational Control Centers: On May 5, 2008, the FAA’s Flight Standards Service issued an advisory circular (AC 120-96) highlighting the “best practices” for use by HEMS operators in establishing their control centers and training their specialists. FAA/Association of Air Medical Service (AAMS) Safety Meeting: On July 11, 2008, 80 representatives from the FAA and HEMS operators met in response to recent accidents. Discussions focused on night operations in poor or deteriorating weather, risk management, complacency, the agency’s policies on the use of Night Vision Goggles (NVGs), as well as helicopter shopping. Based on these results, the FAA will determine next steps. On November 14, 2008, the FAA published a Notice in the Federal Register that advised operators of important mandatory changes to HEMS flights. The agency also included a provision to encourage the use of NVGs and Terrain Awareness Warning Systems. Consistent with NTSB recommendations, all HEMS operators will comply with Part 135 weather minimums, including repositioning flights with medical crew onboard. The FAA is also providing greater access to weather reporting facilities, and requiring the flight crew to determine a minimum safe altitude and obstacle clearance prior to each flight. The compliance date is no later than February 22, 2009. In March 2006, the FAA and the University Corporation for Atmospheric Research hosted a weather summit in Boulder, Colorado to identify the HEMS-specific issues related to weather products and services. Attendees explored possible regulatory improvements, weather product enhancements, and operational fixes specific to HEMS operations. Attendees included the National Weather Service, National Center for Atmospheric Research (NCAR), Helicopter Association International, American Helicopter Society International, Association of Air Medical Services, National EMS Pilots Association, National Association of Air Medical Communications Specialists, manufacturers, and many operators. As a result, the FAA funded the development and implementation of a graphical flight planning tool for ceiling and visibility assessment along direct flights in areas with limited available surface observations capability. It improves the quality of go/no-go decisions for HEMS operators. The tool was fielded in November 2006. The response from the users continues to be very favorable (Notice 8000.333, HEMS use of the aviation digital data service experimental HEMS tool). The FAA has a solid record of facilitating safety improvements and new technologies for EMS helicopters, including certification of Night Vision Goggles (NVGs). Since 1994, the FAA has worked 28 projects or design approvals called Supplemental Type Certificates (STCs) for installation of NVGs on helicopters. This number includes EMS, law enforcement and other types of helicopter operations. Of the 28 projects, the FAA has approved approx. 15 NVGs STC’s for EMS helicopters. The FAA initiated and wrote (in coordination with RTCA) the minimum standards for NVGs/cockpit lighting. Technical Standard Order (TSO) C164 was published on September 30, 2004 referencing RTCA document DO 275 Minimum Operational Performance Standards (MOPS), published October 12, 2001. The FAA has hosted workshops to help applicants work with the FAA to obtain NVG certification. One set of NVGs costs approx. $7,000 and an operator must carry multiple sets per flight. Certification is just one step. The operator must also have an FAA-approved training program for using NVGs. The FAA has revised the NVG guidance in the Operations Inspectors Handbook, Order 8900.1. Produced using considerable industry input, the revision includes the establishment of a cadre of NVG national resource inspectors (Notice 8000.349, Night Vision Imaging Systems). While the FAA encourages use of NVGs where appropriate, they are not a one-size-fits-all magic bullet. Flying at night is not inherently dangerous if rules and procedures are followed. In fact, many operators who do not use NVGs have never had an accident at night. Flight Data Recorders (FDRs) are not required for HEMS operations. FDRs offer value in any accident investigation by providing information on aircraft system status, flight path and attitude. The weight and cost of FDR systems are factors. Research and development is required to determine the appropriate standards for FDR data and survivability in the helicopter environment, which typically involves substantially lower speeds and altitudes than airplanes. Funds are currently best invested in preventive training. However, the FAA is considering alternatives to expensive and heavy airliner-style FDRs, especially in light of the relatively low-impact forces in most helicopter accidents. By establishing a standard appropriate to the helicopter flight envelope, the FAA may be able to make meaningful future FDR rulemaking efforts. The FAA supports the voluntary implementation of Terrain Awareness Warning Systems (TAWS) and did consider the possibility of including rotorcraft in the previous TAWS rulemaking process. Through this process, however, the FAA concluded that there are a number of issues unique to VFR helicopter operations that must be resolved before the FAA considers mandating the use of TAWS in this area, such as modification of the standards used for these systems. For example, helicopters typically operate at lower altitudes so TAWS could potentially generate false alerts and “nuisance” warnings that could negatively impact the crew’s response to a valid alert. TAWS use in HEMS operations required study of TAWS interoperability within the lower altitude HEMS environment, and possible modification of TAWS system standards. At the FAA’s request, RTCA, Inc. established a Special Committee (SC-212) to develop H-TAWS standards for use in future FAA rulemaking projects. The final report was delivered to RTCA in March 2008. Those standards were subsequently reviewed by the FAA’s Aircraft Certification Service and on December 17, 2008, the FAA issued Technical Standards Order (TSO) C-194 to standardize the manufacture of H-TAWS within the industry. Change terminology to “helicopter air ambulance” in lieu of “helicopter EMS” to remove reference to “emergency” regarding the air transportation flight. Facilitating more IFR operations by permitting helicopter air ambulance operators to continue IFR approaches into hospitals or airports using weather reports from nearby stations rather than requiring weather reports specifically from the destination location. Air-ambulance helicopters have the worst fatal crash record in aviation, and their crews are among the most likely to die on the job, an expert told a panel of federal investigators Tuesday. The rate of fatalities per 100,000 air-ambulance employees over the past 10 years exceeds other dangerous professions such as logging or deep-sea fishing, said Ira Blumen, program director of the University of Chicago Aeromedical Network. Blumen’s comments came during the first day of a hearing by the National Transportation Safety Board (NTSB), which is examining the industry’s burgeoning accidents. “It’s a high-risk occupation. It’s alarming,” Blumen said. Relatively few patients have died: 34 out of about 4.3 million transported since 1972, Blumen said. It’s unclear why; one possible explanation is that air-ambulance flights spend more time flying without a patient than while carrying one. A typical emergency run involves three trips: one to pick up the patient; another to transport the victim; and a third to return to the helicopter base after the patient is dropped off. Another reason is that crewmembers outnumber patients three or four to one on flights. Tearful relatives of recent crash victims demanded that the Federal Aviation Administration (FAA) take action to stem the death toll. Steve Ogletree, 44, an airport manager whose 14-month-old granddaughter, Kirstin Blockinger, died in a crash Oct. 15, said he was stunned by how lightly the government regulates the industry compared with airlines. “I say to the FAA, shame on you,” Ogletree said. The FAA has pushed the industry to adopt stricter safety standards but has emphasized voluntary change because it can be accomplished faster than writing new regulations, FAA spokesman Les Dorr said. Since 1972, 264 people have died in air-ambulance crashes, according to Blumen. Nine fatal crashes since December 2007 have killed 35 people. That’s the highest death toll in the industry’s history. The accident statistics for the USA stand in stark contrast to Canada, which has not had a fatality since 1977. Unlike most companies in the United States, Canada requires two pilots on each helicopter, and flights are conducted under more rigorous standards for weather, said Sylvain Séguin, a vice president of Canadian Helicopters. The NTSB hearing is trying to pinpoint what could be driving the recent increase in fatal crashes. Several witnesses raised concerns about whether competition to make the helicopter flights — which can pay as much as $10,000 — could be driving up the accident rates. “The safety board is concerned that these types of accidents will continue if a concerted effort is not made to improve,” NTSB member Robert Sumwalt said. They were on their way to rescue a person in distress off North Avenue Beach. But the crew of a Chicago Fire Department helicopter found themselves in trouble Friday when they had to make a hard emergency landing on the lakeshore. The two pilots and two divers on board suffered minor injuries, but damage to the helicopter, which came to rest upside down near 3900 S. Lake Shore Dr., was extensive, Fire Department officials said. The reason for the emergency landing is still under investigation. The noon crash happened as the helicopter was en route to North Avenue Beach, where a man was reportedly having trouble in the water. The helicopter flight to take heart patient Jerry Leonard from one Indiana hospital to another should have been routine. But on the night of the trip, April 20, 2004, the pilot on the Air Evac Lifeteam air ambulance apparently forgot to adjust the helicopter’s altimeter, federal records show. When he slammed the helicopter carrying Leonard into a hillside near Boonville, Ind., the cockpit gauge showed he was 310 feet off the ground. “Boy, I screwed up,” pilot Richard Larock told an emergency worker who responded to the crash. Larock and two medical workers survived, but Leonard — 63 years old and strapped to a gurney — was flung from the helicopter, the stretcher strap forced against his throat. “It took 10 minutes for him to strangle to death,” says his son, Keith Leonard. The flight that was supposed to help save Leonard’s life killed him instead. Since 2000, 60 people have died in 84 crashes — more than double the number of crashes during the previous five years. During that period, more than 10% of the U.S. air ambulance helicopter fleet crashed. If commercial airlines lost the same proportion of large passenger jets as air ambulance companies lost helicopters, 90 airliners would crash each year. Despite the surge in the number of crashes, however, air ambulance companies and the federal agency that oversees them failed time and again to take steps that might have averted tragedy and saved lives, a USA TODAY investigation shows. The newspaper reviewed hundreds of pages of documents and interviewed dozens of pilots, aviation experts, federal officials, and executives with the companies that operate the flights. Because government statistics on air ambulance crashes are sparse, USA TODAY also created its own database of 275 accidents since 1978. Unlike passengers on commercial jets, the people being transported by air ambulances — many critically ill or injured in accidents far from hospitals — had no choice but to make the flights. The crashes that killed them often involved egregious errors by pilots and crew. In one case, a helicopter carrying an 11-day-old child and her mother slammed into the side of a mountain at night. In other crashes, pilots flew into thick fog even after other air ambulance pilots had refused to fly. Accident reports by the National Transportation Safety Board read like a horrifying guide for how not to fly. On March 10, 2000, a pilot charged with taking a sick infant to a Texas hospital lifted off in fog so thick that an ambulance driver and others on the ground quickly lost sight of the helicopter. The pilot’s employer, Temsco Helicopters Inc., forbade flying in such conditions, which require instruments to navigate, according to the NTSB. The pilot had only one hour of instrument experience. The helicopter crashed less than a mile away, killing all four people aboard. On Aug. 26, 2002, medical workers on a Rocky Mountain Helicopters mission fled a burning helicopter after a crash landing without evacuating the patient — a baby with respiratory problems. The pilot had landed on a highway in Bradenton, Fla., after the helicopter’s engine caught fire. The pilot and three medical crewmembers fled. The pilot told investigators that he saw the baby after returning to fight the fire, and he rescued the child. On July 13, 2004, a Med-Trans Corp. helicopter flew to a highway accident in Newberry, S.C., after three other helicopter companies turned the job down because mist and fog blanketed the area. Seconds after taking off with the patient, the helicopter struck nearby trees and crashed. All four people aboard died. On Aug. 21, 2004, an Access Air Ambulance flight carrying an 11-day-old infant and her mother to a Reno hospital slammed into a mountainside in a remote area of northern Nevada. The pilot was following a well-traveled route over a mountain range on a moonless night but didn’t climb high enough. All five people aboard died. On Oct. 20, 2004, a helicopter left Santa Rosa Beach, Fla., to pick up a patient at a hospital in De Funiak Springs, Fla., even though a nearby weather station reported low visibility, according to preliminary findings by the NTSB. The company, Metro Aviation Inc., was not certified to fly in such conditions. After only two minutes, the pilot radioed that he was attempting to return because of bad weather. The helicopter crashed into a bay, killing the pilot and two medical workers. • Despite at least nine crashes since 2003 in which a disoriented pilot flew into the ground, federal regulations exempt helicopters from some of the most basic safety standards and equipment required for commercial airlines, including devices that warn pilots when they get too close to the ground. • Government inspections of air ambulance operations, a process critical to holding companies accountable for safety, are haphazard and inadequate. A draft report by a Federal Aviation Administration task force that studied the crashes last year concluded that inspections are “hit-or-miss” and that some accidents were “partly attributable” to poorly trained inspectors. In three fatal crashes last year, FAA inspectors had never visited helicopter bases to check pilot credentials, maintenance records and other documentation, steps crucial to ensuring safe flight. Some medical studies also question the need for many air ambulance flights. A 2002 study in The Journal of Trauma found that helicopters were used “excessively” for patients who weren’t severely injured, and often didn’t get patients to the hospital faster than ground ambulances. One possible explanation for the alleged overuse: profit. Air ambulance firms receive roughly $7,500 per flight from insurance companies or Medicare. But industry leaders cite other studies to show that thousands of lives are saved each year by speedy flights to hospitals — far more than are lost in crashes. A study this year in the Air Medical Journal found that states with better air ambulance coverage tended to have lower highway fatality rates. “We do this because there are benefits,” says Tom Judge, president of the Association of Air Medical Services, the industry’s trade group. Pilots sometimes find themselves in particularly trying situations. Despite darkness or bad weather, they may be summoned to accident scenes. They aren’t supposed to take off in poor conditions, but their decision whether to fly could mean life or death. “I don’t know anybody in this industry who isn’t dedicated to safety and dedicated to what we do,” says Ron Fergie, president of the National EMS Pilots Association. FAA and industry officials say they are moving to improve safety. Among the steps: encouraging companies to buy night-vision goggles, which allow pilots to see hazards in the dark, when the majority of crashes occur. The FAA also has worked with companies to develop procedures to help pilots decide whether to stay on the ground in dangerous conditions. The agency pledges to review safety standards at every air ambulance company this summer. And industry trade groups say many companies are improving training without waiting for mandates by the FAA. But in the face of industry concerns about cost, many of the most promising safety enhancements have not been required. Flight regulations have not been rewritten. The FAA hasn’t followed key safety recommendations it received from its own task force last December. And though safety reviews of companies are planned, Ballough concedes the agency still lacks a system to ensure that all air ambulance bases — especially those located far from their companies’ headquarters — are inspected. In interviews, the FAA offered no explanation for why it failed to act earlier or devote more resources to monitoring the air ambulance industry. But the upswing in crashes occurred as the agency faced growing pressure to tighten oversight of large airlines after the crashes of a ValuJet flight in Florida in 1996 and an Alaska Airlines jet in California in 2000. When Jerry Leonard was killed as a result of the Boonville, Ind., crash last year, “it was just like somebody driving a knife through your heart,” Keith Leonard says. The Leonard family had driven to Deaconess Hospital in Evansville, Ind., to meet Leonard, who was having heart problems. He was being airlifted there from a hospital in Huntingburg, Ind., 40 miles away. Leonard never arrived. The family “believed that this air ambulance, with a pilot and paramedic and nurse, were going to provide him with state-of-the art care and deliver him safely to a hospital,” says Lebovitz, the family’s lawyer. Air Evac declined to comment on the accident, but spokeswoman Julie Heavrin says the company has taken several actions to improve safety, including buying a helicopter flight simulator for training. Across the industry, however, mistakes by pilots remain the cause of the overwhelming majority of crashes. The newspaper’s analysis of almost 30 years worth of accidents shows that 82% of fatal crashes were caused by human error — almost all by pilots. In 2000, the air ambulance trade group called on the FAA to push companies to emulate the type of training used by airlines to minimize mistakes. Known at airlines as “Crew Resource Management,” the training teaches pilots to listen to concerns from other crewmembers and to monitor themselves for factors such as fatigue and tension. In July 2000, an industry committee suggested language for such a training program and sent it to Jane Garvey, the FAA’s administrator at the time, says J. Heffernan, an air ambulance company official who headed the effort. “We don’t know what happened after that,” Heffernan says. Some companies went ahead with the training program, but it was never endorsed or addressed by the FAA. Agency spokeswoman Alison Duquette says the FAA found no record that it even received the industry’s recommendations. No one can say for sure whether the industry’s suggested safety program would have prevented air ambulance crashes if it had been instituted industrywide. But similar programs at airlines are credited with reducing accident rates. Today, about five years and dozens of crashes after the industry first proposed the safety program, the FAA is preparing to formally endorse it. A proposal within the FAA to gather more data on how many hours air ambulance firms fly also went nowhere. As a consequence, tracking the accident rate — that is, how often air ambulances crash compared with the number of flight hours — remains impossible. In a statement in response to the newspaper’s questions, the FAA says it doesn’t need to track the hours of air ambulance flights. “We know the causes for these accidents and know what intervention strategies are needed,” the statement says. The air ambulance industry has stopped waiting for the FAA to act. It now has begun gathering that flight information itself. Pilot Craig Bingham knew the weather was bad on Jan. 10, 2003. Fog had reduced visibility to one-sixteenth of a mile in parts of Salt Lake City. A pilot from another air ambulance firm had even called to warn him against flying, federal records show. But Bingham took off anyway, hoping to rescue a motorist injured on the highway. The veteran pilot apparently became disoriented in the fog and crashed into a field, federal records show. The accident killed Bingham and a paramedic. A flight nurse was severely injured. The unique mission of the air ambulance industry has contributed to the difficulty of preventing crashes. Unlike charter or airline flights that go into airports, air ambulances land on hospital roofs or, worse, by the sides of rural roads at night. And instead of delivering anonymous airline passengers, air ambulance pilots are charged with helping save lives. That mission can prompt pilots to press on in conditions when others might turn back. Airlines and safety regulators have conducted a decades-long battle against pilot mistakes by improving training, oversight and technology. The combination has led to the safest period in commercial aviation history. • About two-thirds of fatal air ambulance crashes occur in poor visibility, the newspaper’s analysis shows. Even so, pilots are not required to have special training about what to do when they encounter fog, snow or darkness. • Air ambulance pilots need not obtain a weather report for their destination if they are not carrying a patient. Similarly, FAA rules that restrict how many hours pilots may work do not apply to flights without a patient. • Helicopters are exempt from the federal rules that require data recorders on most planes that carry people for hire. The lack of these recorders in air ambulance helicopters makes it more difficult to determine what caused accidents — and to prevent future crashes. Veillette now flies a business jet. He says the contrast between that type of flying and the air ambulance world is stark. In a jet, air traffic controllers guide him away from hazardous conditions. His cockpit is equipped with the latest safety devices, including one that sounds an alarm if he strays too near to the ground. A company dispatcher won’t allow him to take off unless conditions are safe. For the air ambulance industry, “these multiple safety layers don’t exist,” he says. No one was seriously hurt on Aug. 31, 2002, when an Air Methods Inc. helicopter clipped a parking garage as it tried to take off at Miami Children’s Hospital. But an investigation of the accident revealed the lack of oversight that occurs at many air ambulance bases, particularly those far from company headquarters. The FAA had never inspected the helicopter operation because it was new, the National Transportation Safety Board found. Construction at the hospital had rendered the heliport dangerous, but the hospital had never told state and federal officials of the changes. Air Methods CEO Aaron Todd says the company would “never accept a contract” that it could not perform safely. Regardless, the case illustrates how FAA inspectors have been unable to keep up with the dramatic growth in the air ambulance industry. Air ambulance companies have expanded rapidly since the late 1990s as firms began competing in urban areas and demand for air ambulance services surged in rural areas where hospitals had shut down. The industry’s trade group estimates that, since 2000, the number of air ambulance helicopters has climbed 50%, from 500 to about 750. The average number of crashes climbed even faster, from about five per year during the early and mid 1990s to more than 15 per year since 2000 — a 200% increase. After investigating three of the worst air ambulance crashes last year, two involving Med-Trans Corp. helicopters, the NTSB found that FAA inspectors had never visited each of their local operations. The NTSB is investigating pilot decisions in all three accidents, says Jeff Guzzetti, who oversees the NTSB’s air ambulance crash investigations. Eleven people died in the crashes, including two patients and the mother of one patient. In one case, a Med-Trans crew flew to a roadside accident in South Carolina on July 13, 2004, after three other crews declined the mission because of bad weather. In another crash, a preliminary NTSB investigation shows that a pilot flew into a storm near Peyote, Texas, on March 21, 2004, after failing to check the weather, Guzzetti says. Med-Trans spokesman Reid Vogel calls the company’s crews “highly skilled” and committed to safety. A rapidly growing company based in Bismarck, N.D., Med-Trans has 12 helicopter bases around the country. But the only FAA inspectors assigned to monitor the firm were based in Arizona, near one of the company’s bases. “The safety board investigators are interested in the adequacy of FAA oversight of air ambulance companies, especially ones which conduct operations all over the country, but have one FAA office responsible for oversight,” says Guzzetti. The NTSB plans to release a study of the industry later this year. Linda Goodrich, vice president of the Professional Airways Systems Specialists, the union that represents inspectors, says staff reductions and budget cuts have made it increasingly difficult to inspect air ambulance operations. The number of employees whom the FAA classifies as inspectors is expected to fall from 3,600 to about 3,400 this year, the FAA says. And hundreds of those workers are assigned to FAA’s Washington headquarters or are managers who do no inspections. FAA requests to add inspectors were turned down by the Bush administration. As a result, the agency focuses its resources on its biggest mission: inspecting large airlines. The FAA’s Ballough says his department is trying to order more inspections of air ambulance firms. But at a time when the FAA’s aviation oversight budget has been cut by $25 million, or 5%, the agency can’t afford to devote too many inspectors to this relatively small corner of the aviation industry. “It’s an issue of resources,” he says. The FAA task force also concluded that several fixes could improve safety. Its draft report called for mandating improved pilot training for handling poor visibility, tightening air ambulance rules to make them more consistent with those for small airlines, and making weather limitations more strict. All of the recommendations could be put in place quickly, without the lengthy process of writing new regulations, the report says. But the FAA and the industry have stuck to voluntary enhancements, avoiding mandates that change rules and require better equipment. Ballough says some rule changes will come, but he says the FAA must proceed cautiously to ensure it chooses the right solutions. The industry also wants to move slowly. In a letter to FAA officials in January, the industry trade group said that imposing costly new safety rules might put some operators out of business. Richard Healing, an NTSB member, says air ambulance operators need to be especially vigilant about safety because accident victims and hospital patients usually have no choice whether to fly. For Keith Leonard and others who lost loved ones in accidents, the damage cannot be undone.